Well, I am now back in Dubai and just reminiscing about my day in London on Monday. It was my day off before I had to fly back to Edinburgh for work and I had a few hours to pack in a visit to my favourite places. Luckily Farfetch basically lent me a black cab for the day. Result! 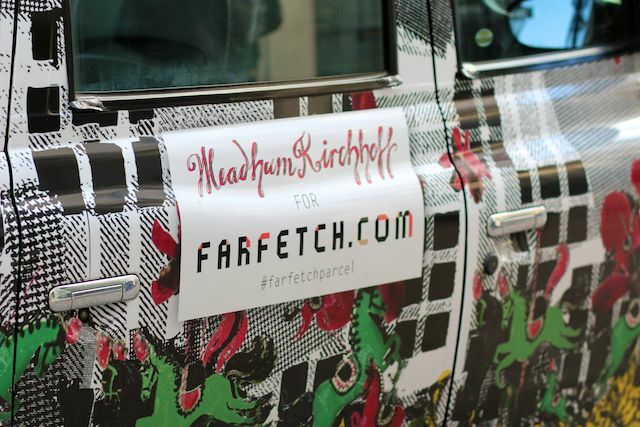 I love black cabs and even better when they are a) free and b) decked out in a pretty Meadham Kirchhoff print like the one below. I took the taxi to the Charlotte Street Hotel (one of my all time favourite places in London) and then, after lunch, headed over to the King's Road and specifically to the Brandy Melville store that I had heard about via Rose/AKA The Londoner. It didn't disappoint and I stocked up on skirts, dresses and tops - and all for a good price. Definitely recommend you have a look if you haven't already. For the occasion I dressed in my "urban" gear. That means oversized jackets, murky coloured jeans and flat boots. This is my cold weather comfort zone and I love it. I did try and spruce it up a bit with my fur collar from Topshop (which by the way I didn't realise would be green when I ordered online but I really like in real life) and by borrowing a handbag from mother dearest. Come on....how gorgeous is this Resort 2012 Balenciaga Velo? Very jealous! T-shirt - Zoe Karssen - majorly discounted on The Outnet. Thank you very much! Link! 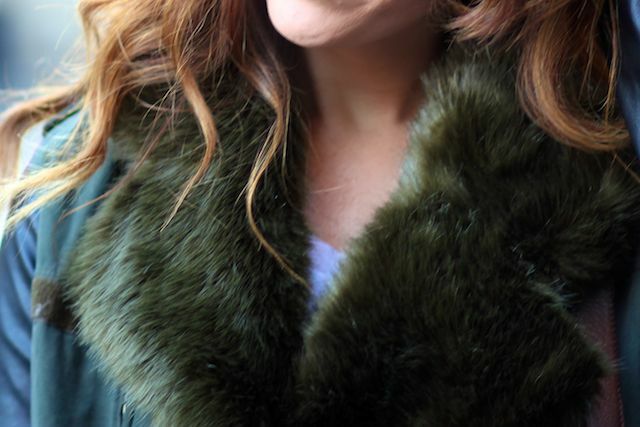 Fur collar: Topshop - Link! 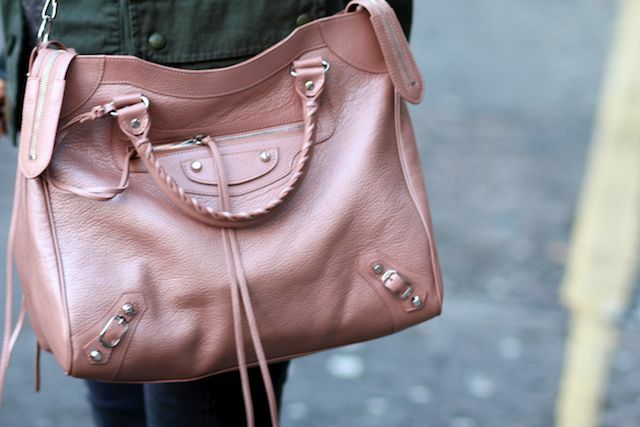 Bag: Balenciaga - link provided in case you really want to treat yourself :) Link! Sunglasses: House of Harlow - Link! Good luck with last minute Christmas shopping everyone! Oh that bag is gorgeous!! :) I love love love it, Pearlizied pink leather. Perfect! Gorgeous bag, so jealous! Hope you have a very Happy Christmas! I am jealous too :) Happy Christmas to you Sarah! This sounds fantastic, what a great way to spend your day and of course you look gorgeous doing it! Your outfit is fab! I need that jacket. They were epically kitsch! Thanks Sheree! those boots are perfect! i think i'll always have an obsession with them, a boot buying ban is needed! I wasn't sure about the green fur at first but you made it looked fab! The bag is just perfect and I love the colour.Very nice and comfy look. I love your "urban" look! And that hair is to die for! 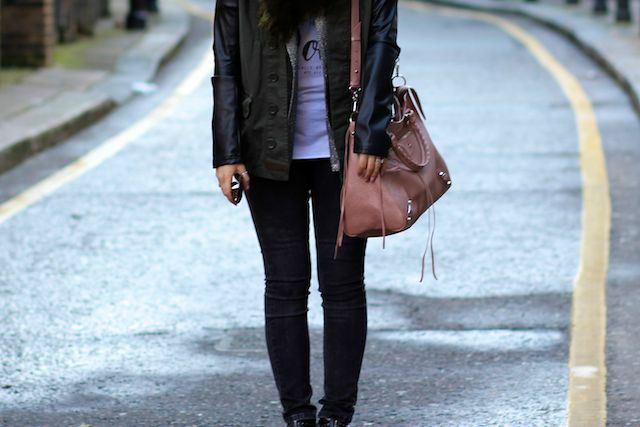 That is a fab bag, mine is in taupe with rose gold hardware. Love! Đại Trưởng lão vẻ mặt kích động thét lên be be. mời theo, Long Tộc các ngươi sẽ có thực lực đối phó với Đoạn Vân ta sao? giúp đỡ Long Tộc, ta sẽ hạ thủ không lưu tình với ngươi đâu!" Vị Nhị Trưởng lão mắt rất dài kia cười nói với Đoạn Vân.